Nangzhig Kyabgon was born in 1983 and was recognized as the reincarnation of Nangzhig Kyapgön Tenpa Rabgye by high lamas of both Bön and Buddhist traditions. This includes very esteemed lamas such as Menri Yongzin Tenzin Namdak Rinpoche and the late 10th Panchen Lama. At the age of six, Nangzhig Kyapgön took monastic vows in front of the golden tombs of Nangzhig high lamas. 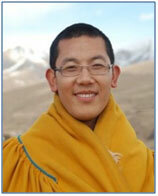 He was initiated in the presence of four lamas, including Jawob Rinpoche. With a great celebration, he was enthroned upon the Golden Throne of Nangzhig Monastery. Afterwards, he studied with Yongzin Tenzin Yeshé as well as other teachers. He became an expert in philosophy and science, particularly the unique Bön doctrine and philosophy. 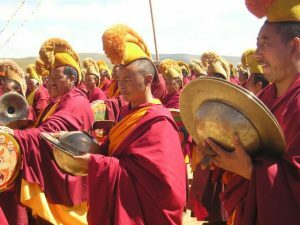 He also traveled to many different parts of Tibet and gave teachings and empowerments to all of his followers. 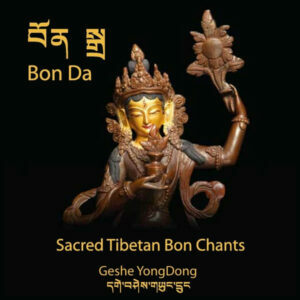 He blessed the faithful with his empowerments of A Tri (A khrid), Nyengyü, and Dzogchen as well as with the internal, external and secret Bön initiations. At the age of 19, he visited China’s sacred Buddhist Mount Wutai (Riwo Tse-nga) and there he did the retreat practice of Sherap Mawé Sengé (Bönpo Buddha of clear intellect and understanding). Then, he went to study at the Buddhist University in Beijing and graduated in the doctrines and philosophies of various traditions. During his time there, he also learned the Chinese language. During both the First and Second International Conference on Yungdrung Bön, he acted as president. 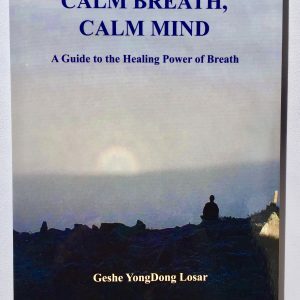 In brief, he has completed his studies of Bön Sutra, Tantra, Dzogchen as well as other Tibetan cultural sciences and philosophies with Yongzin Tenzin Yeshé and the renowned scholar Böngya Rinpoche. Thus, he is the head and the throne holder of the Nangzhig Monastery.